I’ve got two books to recommend you might be interested in if you love vernacular photography and ephemera. 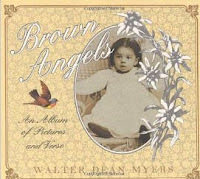 The first, Brown Angels, is a small book of original poetry by Walter Dean Myers coupled with really wonderful photos of African-American children from the early 20th century. I found it in a used bookstore after Christmas and fell in love with the images before I'd even read the poems. It’s a really sweet and joyous children’s book, but being a collector of vernacular photography I knew I needed to add it to my collection of photo books, not just my children’s book collection. The second, The Scrapbook of Frankie Pratt: A Novel in Pictures, is simply a lot of fun. Author Caroline Preston has taken ephemera from her collection and created a “novel” telling the story of young Frankie Pratt from her teen years to early 20s. Page after page of what appears to be her scrapbook, a story unfolds of young Frankie’s life as she longs to be a writer. Love, college, Paris, and again love provide the storyline. I really can’t say enough about it. Wonderful images throughout and a real treasure trove for artists looking for inspiration. To see more about either book you can click on the links in the left column to read reviews at Amazon.